Back in January, Brooklyn Nine-Nine bowed out for a mid-season hiatus with an aggravating and seemingly arbitrary cliff-hanger, involving ‘Gina’ getting hit by a speeding bus at the end of the episode. It felt like such a cheap, attention-grabbing “gotcha” moment, that it made me seriously consider giving up on the show altogether… but then Chelsea Peretti announced that she was with-child, and I realised that there were extenuating circumstances behind this rather ham-fisted plot-twist. As strategies for covering up an actress’s growing baby-bump go, Gina’s new “halo” head-brace thingy is actually pretty ingenious, and is certainly preferable to the insufficient array of cushions and large purses that are often utilised in similar straits. I was worried they were going to confine her character to a hospital bed, or write her out entirely for a couple months, but thankfully she’s still lurking around the station-house (for now), as full-of-herself as ever, despite the short-term memory loss. Phew! 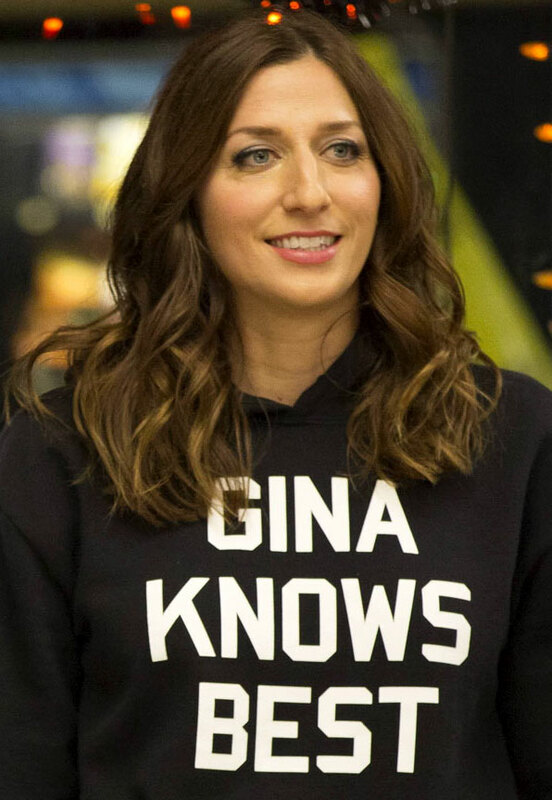 Weirdly, this season has seen her evolve into the squad’s eccentric-but-wise voice of reason (“Gina Knows Best”, indeed! ), which is a long way from where she started as an incompetent and corrupt kleptomaniac, so I hope they keep her in the mix for as long as physically possible, because the show would/will be a lot less fun without her. This entry was posted in Rants about TV and tagged B99, Brooklyn Nine-Nine, Chelsea Peretti, Gina Linetti. Bookmark the permalink.